The card ratings are mostly created in vacuum and for Standard Format exclusively. Some cards are much better in Trilogy Format, and notes are sometimes made of this, but the set is reviewed from the point of view of Standard Format play. It is always going to be difficult to adequately rate a card, and all the ratings are obviously going to be subjective, although we have tried to proximate an objective rating. The rating system is 1-5, with 1 being the rating of a card that will rarely see play and 5 a card that will become a staple in many decks and will most likely feature heavily in competitive play. The cards with medals are the 3 stand out cards of that faction and color in the set. 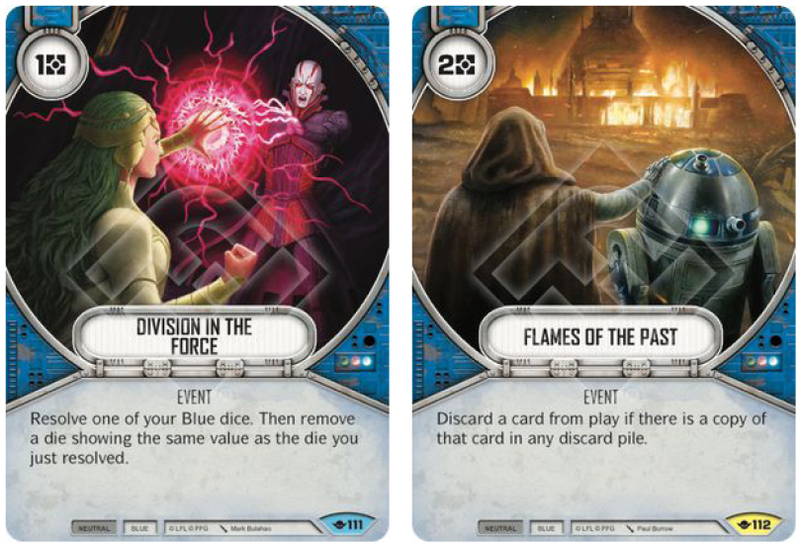 From a design perspective it feels as if the design team are looking towards rotation and are starting to modify some of the existing cards into a new format going along with the design strategy proclaimed by lead designer Jeremy Zwirn: Star Wars Destiny should generally be longer (4-5 rounds rather than 3-4 rounds). I think this is supported by, and becoming more and more evident, in the modification to a number of cards in the blue neutral set. Ah ... and then the Dagger of Mortis! Be still my heart! This could potentially a massive card. Being able to remove unusable die sides and effectively add them as modifiers to other base sides is amazing. if we are to see more mixed damage sides, i.e. Handcrafted Light Bow, Ezra's Lightsaber or blue villains with the Holocron suite, then Become One could be super-effective. Right now, there are not that many crossovers, but the rating could actually go up if future sets where to make it more viable. Right now, some power plays could be to resolve a +3 Melee damage on an Ancient Lightsaber (if it's the only Melee side in the pool) together with a Resource side netting 3 resource off an otherwise dead die in the pool or use it on a Focus side for some absurd aggro plays. Generally it seems as if mitigation is becoming a bit more expensive, but also is seeing an increase in power level. Beguile feels like an upgraded version of Overconfidence, that for the cost of 2 resources allows you to fix 3 dice. Soft mitigating 2 dice and hard mitigating 1. We are of course looking at a game, as it looks right now, where more and more dice are poured into the dice pool, in which case the stock on this will wane a bit, but this can be a massive control card for heroes and villains alike, although it will have to fight it out for a spot in decks with cards like Mind Games. For bicolored or monocolored decks though it will be encouraging to see blue mitigation without any spot requirements to play it. Control falls into the same category of mitigation such as Emergency Evacuation (for red heroes) that allows you to manipulate/control all dice in the pool. The latter removes them from the pool, but also affects removes your own dice, whereas Control keeps all dice in the pool on dice sides of your choice. 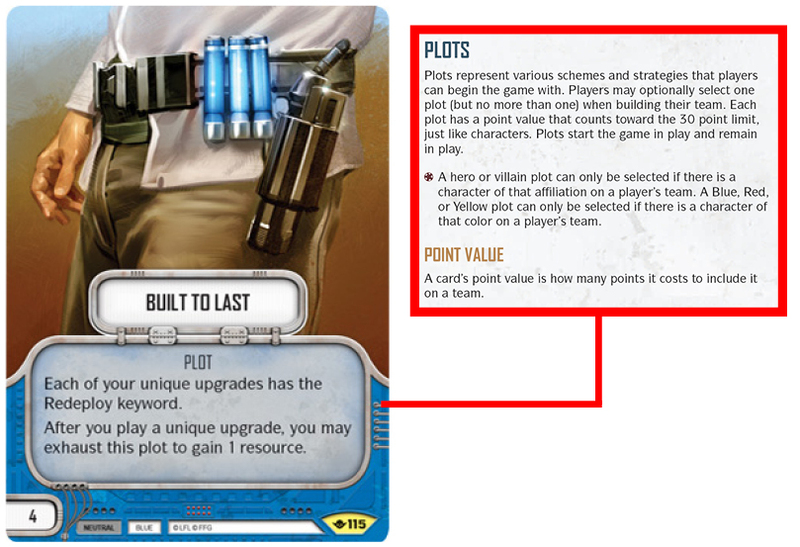 It's important to keep in mind here that you need to TURN all dice, which means that Blanks must be turned into other sides, same goes for dice with favorable results, such as your own big damage sides.The only decks that would reliably be able to play such an expensive event would probably be Yoda based control/mill decks and Thrawn (red/blue) control/vehicle decks. I'm not certain that it is good enough to go into either. I like Division in the Force. It is not safe mitigation such as Isolation, but as we are looking a dice pools with a greater span of different dice results, it is almost assured mitigation, and in particular decks that are trying to play fast paced and claim, this could prove a really powerful card allowing them to resolve a die and mitigating at the same time. Remember that you could resolve a Special and remove a Blank before it's turned by a Focus or re-rolled. Flames of the Past has the potential to become a really powerful card. Blue hasn't had a lot of ways to remove cards from the game outside of Force Rend, while yellow has had several (Disarm, Confiscation, Vandalize, etc.) and red (Law and Order, Fall Back, etc. ), and this card is set to remedy this. Players often pitch cards to re-roll that they don't need now, knowing that there will be a second copy in their deck they can draw into later. Flames of the Past looks to punish them for doing exactly that. Another control card in line with Beguile, which is set to compete with existing control cards, but sets restrictions or comes at a higher resource cost (Beguile vs. Overconfidence, Peace and Quiet vs. Concentrate/Use the Force). There's not spot requirement (like on Use the Force), you can turn any die (as opposed to your own die with Concentrate), but it can only be turned to a Special or a Blank. It would work with Yoda, but so would Use the Force. The card feels underwhelming although it will probably slot into a few Trilogy Format decks. The theme of the set is apparently to look at existing cards, make them slightly more expensive and up the effects. Blue villains have previously had the monopoly on removing shields with Intimidate and Frighten, while only a few ways to gain shields, whereas heroes had several ways of gaining shields, but none to remove. Turn the Tide offers a hybrid version where your net gain of shields is dependent on the shields of your opponent. I don't see this being used in hero decks whereas it could find it's way into a few villain decks. The initial WAAAAAHUUUAAAHH hype of Built to Last ended fast when Aayla Secura was nerfed as it made the two most obvious character teams utilizing this plot to devastating effect unplayable (Cassian/Aayla and Rex/Aayla). Everybody knew the party couldn't last as Aayla was way to strong for her points cost, and while the aforementioned character teams are now just a distant dream, Built to Last is certainly not dead. It still offers a plethora of ways to construct character teams that are built around the plot rather than the plot merely being an addition because you had points to spare. The plot doesn't come cheap, but it has the potential to be nasty! Also remember to read our full article on Plots and how to utilize them. Being able to not only play a unique upgrade 1 resource cheaper, although technically you get a resource back after having paid the full price, AND giving all of them redeploy is really strong. Although, if the tendency to give unique upgrades redeploy (such as Ezra Bridger's Lightsaber, Rey's Lightsaber, Dagger of Mortis, etc.) continues, its stock might drop a bit. Early testings have proven that Honed Skills might actually have what it is needed to make it see competitive play! You are probably not likely to see 4 weapon upgrades on a character, but add in Force Speeds and Force Illusions to the mix, and then you will suddenly need every single upgrade slot you can get. I do think though, that unless future sets are going to reveal cheap powerful upgrades, or prolong the game in general (the number of rounds played), Honed Skills might gradually fall out of favor. It favors midrange decks over super-aggro decks and could see use in Built to Last style decks. 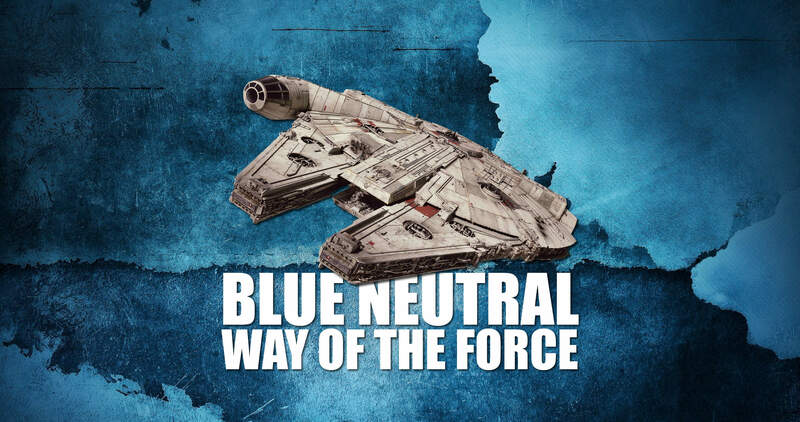 DAMN ... FFG really does have a lot of love for blue - don't they! Dagger of Mortis follows the same pattern as most blue weapon upgrades with 3 Melee sides, 1 Shield side and 1 Resource side, nothing new here, but a unique upgrade with HUGE damage sides AND with redeploy. They are really pushing it here. There are so many character teams that are going to love the dagger and with the amount of quality melee based upgrades out there, I guess no-one is really going to miss the Holocrons when they rotate out. This is definitely one of the cards of the set and will easily and quickly become a fan favorite. Hold on to yours, they'll be in HIGH STOCK! I saw a guy comment on the photo asking what would happen if you rolled a Blank. That sort of made my day! 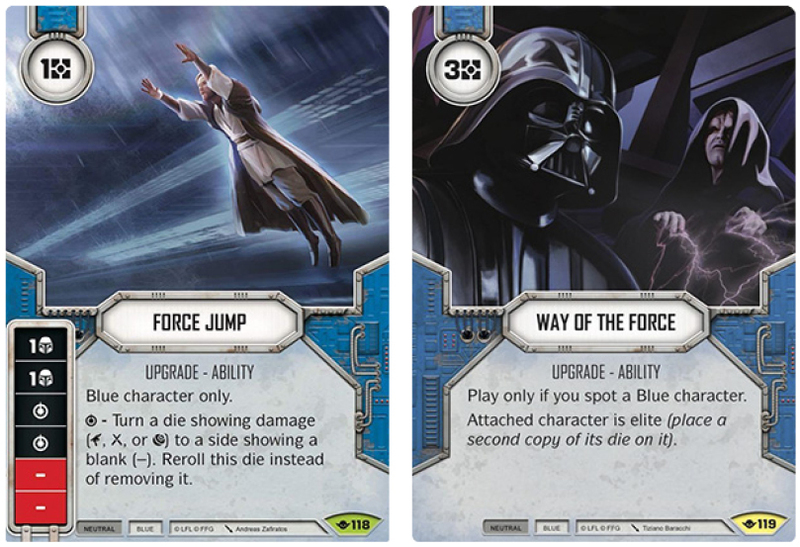 The force abilities in this set are generally unimpressive, this also applies to Force Jump. Outside of a Yoda based deck I don't really see this card being played. 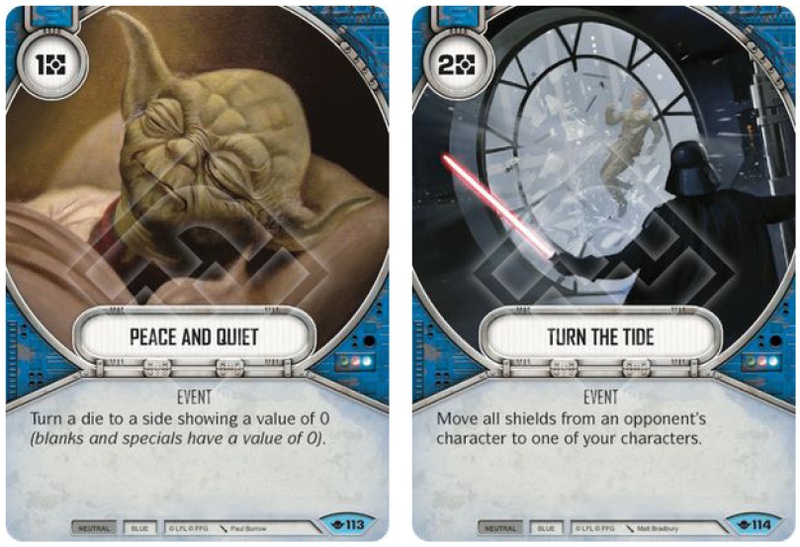 It might have some traction in a Yoda/x mill deck (maybe Yoda/Leia), although the weakness as always with force abilities is that it's only playable on a blue character. Upgrading the previous Training for non-unique characters to Way of the Force for any character as long as you spot a blue character (it can still be played on any character). 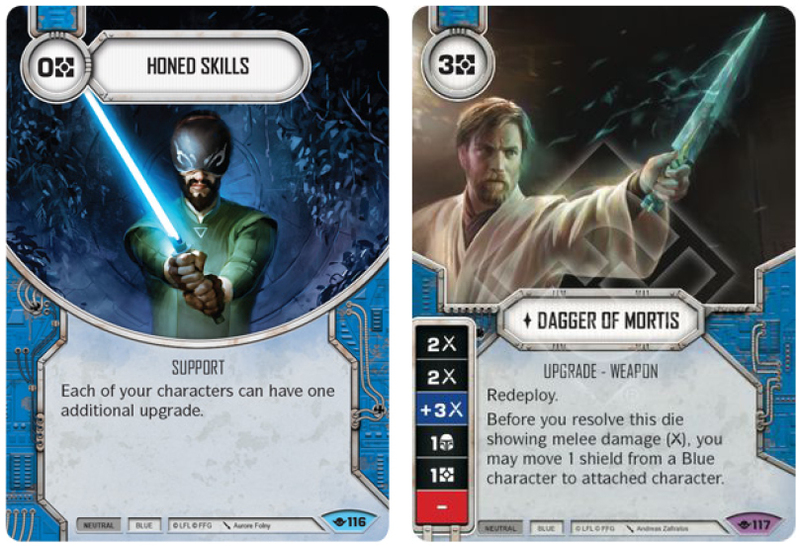 I think the online jury is still arguing over whether or not becoming an elite character also increases the points cost of the attached character, which is relevant for a number of upgrades and card effects such as the Darksaber. I'd say no, but I'm eagerly awaiting an official ruling on it. I think 3 resources is expensive, and there are a lot of other 3 cost upgrades out there, that'll add a die to a character that would be equally competitive. I've upped the rating though because it does mean that you an start creating character teams that would not have been viable before and thereby allowing for 3 wide and 4 wide builds that could be good!